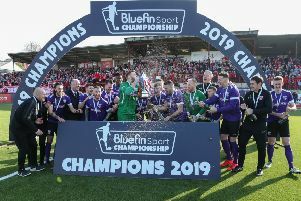 Larne manager David McAlinden said he will consider his own role at the club after seeing his side crash out of the Irish Cup with a heavy defeat away to Loughgall. McAlinden cut a disappointed figure after the 5-2 defeat which sees the Invermen miss out on an opportunity to book a place in the last 16 of the competition. The contest was as good as over at half-time with Loughgall leading 4-1, despite Thomas Robinson giving Larne an early lead. “In the first half we gave ourselves a mountain to climb and we weren’t able to climb it,” McAlinden said. “Sometimes in football you can do things to a certain level and then for whatever reason it can’t go any further than that level. Too many times we are conceding too many goals. We’re working on too many goals for that to happen. “When people aren’t carrying out those instructions then maybe it’s the wrong message or being delivered in the wrong way. It started brightly for the visitors and Robinson fired in the opener as he scored from the edge of the box, after Gerald Gillan’s corner was only partially cleared. Loughgall responded quickly and Aaron Walsh lashed in the equaliser barely a minute later. Warner Mullen curled a fine effort into the top corner on 22 minutes and it was 3-1 before the half hour mark as Jamie Rea was quickest to react after Daniel Ryan’s shot hit the post. Mullen’s second of the day killed the game as contest, just a minute before the break. It got worse for the Invermen on 53 minutes as Daniel Ryan found space wide in the box and drove in effort off Paddy Flood’s near post. Guillaume Keke reduced the arrears four minutes later as he followed up after an initial effort that was saved by Gareth Buchanan, but it was too little, too late.